GRAND RAPIDS, Mich. (June 15, 2015) – Jim Wilson has been appointed Chief Operating Officer (COO) for Michigan Blood. As COO, Wilson will be responsible for leadership of all aspects of operations including blood collection, donor safety and specialty testing, component preparation, product inventory management, order fulfillment and distribution, facilities management, and equipment and vehicle support services. Wilson comes to Michigan Blood with extensive experience in a variety of senior healthcare leadership roles, most recently as Chief Operating Officer at Mary Free Bed Rehabilitation Institute in Grand Rapids. Prior to Mary Free Bed, Wilson was President of Blodgett Hospital and Vice President of Operations at Spectrum Health. Wilson also held a variety of senior leadership roles, including CEO, at hospitals in Long Island, NY. Wilson earned his M.A. in Health Care Administration, The George Washington University, Washington, D.C., and a B.A. in Economics from The University of Notre Dame, South Bend, Indiana. He is a Fellow of the American College of Healthcare Executives. Wilson has been an active civic and community member. He currently is a member and Former Chair of the Catholic Central High School Development Council, a member of the Dominican Sisters of Grand Rapids Investment Advisory Committee / Charitable Trustees, and a member of the Finance Council for St. Robert of New Minster Parish in Ada. Founded in 1955, Michigan Blood is an independent, nonprofit, blood bank that provides blood for hospitals across Michigan’s Lower Peninsula. Michigan Blood is committed to serving the needs of Michigan hospitals first. Besides blood donation at permanent donation sites, Michigan Blood conducts more than 3,700 mobile blood drives each year. Other related services include Michigan’s first public cord blood bank, blood stem cell (marrow) program, transfusion medicine consultation, transplant center support, and other services. For more information, visit www.miblood.org. April 23, 2015 – Milwaukee, Wis. — The Centers for Transfusion and Transplant Medicine (CTTM), an affiliation of four Midwest blood centers, has unveiled a new name, logo and expanded areas of expertise to better reflect the value it provides to its healthcare partners. CTTM will now be known as Versiti. The four Versiti™ affiliates are BloodCenter of Wisconsin, Heartland Blood Centers, Aurora, Ill., Indiana Blood Center and Michigan Blood. “Versiti provides even greater value to healthcare systems in our communities and across the country through our five areas of expertise,” said Jacquelyn Fredrick, president and CEO of Versiti. “Our new name and logo better reflect the depth and breadth of this expertise and the diversity of our innovative science, products and services,” said Fredrick. For more information and to view our video, visit www.versiti.org. The Versiti name itself was built with a specific meaning. “Ver” communicates truth, accuracy and versatility; while “siti” suggests university and diversity – diverse and innovative science, products and services impacting a broad array of patients. The logo is a focal point of bands and illumination of color which come together signifying strength and the broad array of services being offered through Versiti. SAN ANTONIO – We’re proud to announce that BioBridge Global CEO Linda Myers has been named one of the winners of the 2015 Health Care Heroes awards, given each year by the San Antonio Business Journal. Myers was one of the winners in the category of Outstanding Health Care Executive – Nonhospital-Based. BioBridge Global (BBG) board members Mike Kreager and John Feik submitted letters in support of Myers’ nomination, as did Dr. Steve Davis and Ann Stevens. Davis is a co-founder of San Antonio-based biomedical firm StemBioSys Inc.; and Stevens is president of BioMed SA, a nonprofit organization that supports the biomedical industry in our city. Specific accomplishments that supported Myers’ nomination were helping to bring the World Stem Cell Summit to San Antonio in December 2014, her work in transforming BBG subsidiary QualTex Laboratories into an international leader in infectious disease testing and her vision to build BBG subsidiary GenCure into a major regenerative medicine resource. The SABJ will honor the recipients at a reception on May 28 at the Tobin Center for the Performing Arts. About BioBridge Global: BioBridge Global (BBG) is a San Antonio, Texas-based nonprofit corporation that offers diverse services through its subsidiaries – the South Texas Blood & Tissue Center, QualTex Laboratories, GenCure and the Blood & Tissue Center Foundation. BBG provides products and services in blood resource management, cellular therapy, donated umbilical cord blood and human tissue as well as testing of blood, plasma and tissue products for clients in the United States and worldwide. BBG is rooted in the South Texas Blood & Tissue Center, which has a proud history of serving the South Texas region and beyond for more than 40 years. BBG is committed to supporting groundbreaking research, addressing unmet clinical needs and enabling the development and commercialization of novel biotechnology products. Visit us at www.biobridgeglobal.org. 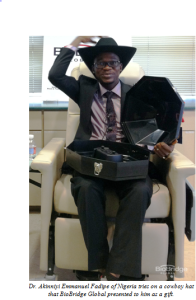 AUSTIN – A team from BioBridge Global’s South Texas Blood & Tissue Center successfully drew a unit of blood Thursday, Feb. 26, from Dr. Akinniyi Emmanuel Fadipe, a Nigerian doctor who survived the Ebola virus. He was drawn at research firm XBiotech in Austin, which will use it to continue their search for a treatment for those afflicted with the devastating virus. 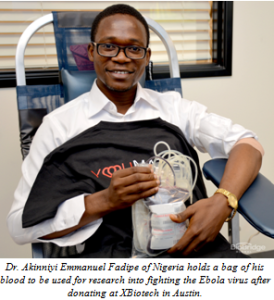 Dr. Fadipe was part of the team that treated the first case of Ebola in Nigeria. He and three colleagues from First Consultants Medical Centre in Lagos contracted the virus and survived; four of their coworkers died. His blood initially was screened at BioBridge Global in San Antonio on Feb. 24 to make sure he qualified for the research. The research involves taking whole blood from Ebola survivors to identify the antibody for the virus and eventually reproduce it. This method could result in the ability to manufacture a therapeutic on a large scale to help treat those affected by the disease. Dr. Fadipe and his team in Lagos established protocols that were called instrumental in sparing Nigeria from a large-scale Ebola outbreak. In September of last year, the World Health Organization said the nation, which is the most populous in Africa, was free of Ebola. He said other survivors are ready to jump into the research if they are called upon. “If more blood is needed for research, I’ve contacted other friends and colleagues who have survived. The antibodies may be different for each survivor, so I want to help do more to study different survivors. I can propose help with that,” he said. He said that on a personal note, he had a great impression of the United States and Texas on his first trip here. During his time in San Antonio, a team from BioBridge Global treated him to dinner and gave him a cowboy hat as a gift. This is the second time in as many months that BioBridge Global has participated in a project supporting Ebola research. In January, an STBTC team traveled to longtime partner XBiotech to draw the blood of Dallas nurse and Ebola survivor Amber Vinson. Her blood also came back to San Antonio to be tested by QualTex Laboratories. About BioBridge Global: BioBridge Global (BBG) is a San Antonio, Texas-based nonprofit organization that offers diverse services in regenerative medicine through its subsidiaries. Its subsidiaries – the South Texas Blood & Tissue Center, QualTex Laboratories and GenCure – provide products and services in blood banking, cellular therapy, umbilical cord blood and donated human tissue as well as testing of blood, plasma and tissue products for clients in the United States and worldwide. BBG is rooted in the South Texas Blood & Tissue Center, which has a proud history of serving the South Texas region and beyond for more than 40 years. BBG is committed to supporting groundbreaking research, addressing unmet clinical needs and enabling the development and commercialization of novel biotechnology products. Visit us at biobridgeglobal.org. CONCORD, Calif. & NEWARK, Del.–(BUSINESS WIRE)– Cerus Corporation (NASDAQ: CERS) and the Blood Bank of Delmarva (BBD) announced today that they have signed a three-year purchase agreement for the INTERCEPT Blood System for platelets and plasma. BBD provides blood transfusion products and services to hospitals and patients in Delaware, Cecil County, Maryland, as well as Maryland’s and Virginia’s Eastern Shores. BBD supplies approximately 13,000 platelet and 21,000 plasma units per year. “The majority of platelet transfusions occur in cancer patients, some of which will receive multiple units over the course of their therapy. It’s exciting and rewarding as a blood center to be in a position to favorably impact the treatment of these patients by providing platelet products that substantially reduce the risk of transmitting viruses and bacteria, and limit the risk of transfusion mediated graft versus host disease,” said Theresa Boyd, MD, Medical Director. Blood Bank of Delmarva (BBD) is a not-for-profit 501(c)(3) community service organization that provides blood and blood components for hospitals in the Delmarva region. For over 60 years, Blood Bank of Delmarva has ensured a safe and continuous supply of blood to meet the needs of over 20,000 patients annually. In addition to blood provisioning, BBD operates a full service regional laboratory providing testing services for blood collection centers. BBD is FDA licensed, a member of America’s Blood Centers, and accredited by AABB. For more information, visit http://www.DelmarvaBlood.org. Cerus Corporation is a biomedical products company focused in the field of blood safety. The INTERCEPT Blood System is designed to reduce the risk of transfusion-transmitted infections by inactivating a broad range of pathogens such as viruses, bacteria and parasites that may be present in donated blood. The nucleic acid targeting mechanism of action of the INTERCEPT treatment is designed to inactivate established transfusion threats, such as Hepatitis B and C, HIV, West Nile Virus and bacteria, as well as emerging pathogens such as chikungunya, malaria and dengue. Cerus currently markets and sells the INTERCEPT Blood System for both platelets and plasma in the United States, Europe, the Commonwealth of Independent States, the Middle East and selected countries in other regions around the world. The INTERCEPT red blood cell system is in clinical development. See http://www.cerus.com for information about Cerus. This press release contains forward-looking statements. Any statements contained in this press release that are not statements of historical fact may be deemed to be forward-looking statements, including, without limitation, statements regarding the expected impact of implementing the INTERCEPT Blood System at the Blood Bank of Delmarva. These forward-looking statements are based upon Cerus’ current expectations. Actual results could differ materially from these forward-looking statements as a result of certain factors, including, without limitation, risks associated with the implementation and use of the INTERCEPT Blood System and other risks detailed in Cerus’ filings with the SEC, including exhibit 99.1 of Cerus’ current report on Form 8-K filed with the SEC on January 5, 2015. You are cautioned not to place undue reliance on these forward-looking statements, which speak only as of the date of this press release. Cerus does not undertake any obligation to update any forward-looking statements as a result of new information, future events, changed assumptions or otherwise. Milwaukee, Wis., — November 14, 2014 – The Centers for Transfusion and Transplant Medicine (CTTM) today announced that Indiana Blood Center, headquartered in Indianapolis, will become the fourth affiliate of CTTM effective January 1, 2015. Established in 1952, Indiana Blood Center is the largest independent blood center in Indiana.